Happy Flash Friday everyone! You may not know it, but April 4th was Jay Garrick’s birthday. Actually, that may not be true anymore. Who knows what day the new Earth 2 version of Jay was born. Regardless of reboot craziness, the real Jay was born on April 4th. To celebrate Superhero Stuff is having a sale! This ended up in my email box because I’ve purchased from them in the past. I figured Flash fans have to stick together, so I’m passing the savings on to you! Just enter in the code FLASH12 and you’ll get 12% off your entire order, even non-Flash items. I do want to disclose that I don’t work for Superhero Stuff or anything like that. I just saw they were having a Flash related sale. If they see this and want to give me a kick back though, I probably won't be upset. 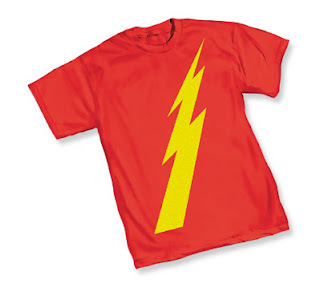 I think I’m going to take advantage of the sale and finally get around to ordering a Jay Garrick shirt. For some reason I’ve never picked one up. Probably because I like the long sleeve version, but there aren't many oppertunities to wear long sleeved shirts in Florida. It seems like buying the short sleeved version is a good way to celebrate his birthday.